The hot, visceral craft of handling the liquid material and sculpting a piece by the ancient art of glass blowing; or the refined and mysterious arts of fused glass and stained glass making. This secret world can now be laid open to you with these highly coveted experiences. Glass glowing experiences come and go, because there are only a few places in the UK that can teach you. If there aren’t any glass blowing experiences available, there will usually be a similar glass making or glass painting experience available. So you can spend time in the company of a master glass blower or an expert stained glass designer, and master these ancient arts for yourself. Where do I find the cheapest experiences? You’re in luck! They’re right here. We’ve brought together for you all the net’s glass experiences, whether the earthy world of blowing hot glass or the cooler craft of creating a stained glass masterpiece, they’re all here. Then our real time price checker gives you the very latest prices So this is your one-stop glass art shop. And note that we only use top flight experience providers, so you’re sure to get a quality experience and top value for money – you will NOT find the rip-off merchants here. Well firstly, you’ll see that there are not many of these courses about. They change regularly, so you may get several stained glass classes one day, then none the next, so you need to keep checking back if the one you want isn’t there at the moment. And secondly, we can tell you that they are very very popular – they get booked up months in advance, but because they require special facilities and materials and expert tutors – especially the hot glass ones – there will always be more people want these experiences than suppliers able to provide them. So the lesson to learn is that if you want a glass experience, then don’t hang about and get it booked while you can. Any links that specifically say “stained glass” are just that. The other links – e.g. “creative with glass” – will show you a range of glassy experiences including the art of blowing glass, the newer craft of fused glass, and of course straightforward stained glass, complete with lead flashings to hold it all in place. Just choose the ones you want from the range. So feel free to click through and check out the detail to see what you get, check that it’s what you want to do, and that the location is somewhere you can get to. These experiences are predominantly around the London area and the South of England, but to learn such arcane skills is a privilege well worth a bit of a trip, we find, and anyone who’s serious about getting to grips with the glass arts will not complain about a bit of travelling. There are three distinct types of glass handling course here, so you need to see which one takes your fancy – unless you want to try out all three, and we can’t blame you if you do. Stained Glasscreation involves firstly the design of your stained glass panel, so your artistic flair can come into full flower here, though your instructor can help with this if you need ideas. You might wish to imitate some of the classic stained glass artists of years gone by with a historical theme, or you could plump for a contemporary look with geometrical or abstract shapes. You’ll then be shown the techniques and tips and tricks of cutting your shapes out of sheets of coloured glass (there’ll be a safety briefing, of course) and then the process of fabricating the cut pieces together by cutting, stretching and finally soldering the lead joining strips, so that by the end of your session you will have your very own completed stained glass panel to display proudly in your own home. You can choose between one day courses and those that stretch over two days where you go into more detail and have longer to refine your craft, so the length of experience is up to you. 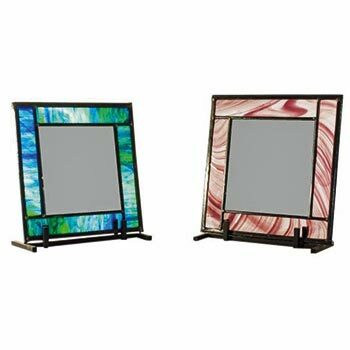 Either way, you’ll create your own panel of stained glass, and get a feel of how much you enjoy this ancient art. Glass Blowing is, as you’d imagine, somewhat more physical and spectacular. All the aspects of “hotshop” activity, around the furnace, will be explained and demonstrated to you , but these workshops are very much hands-on, so in no time at all you’ll be into the technicalities of gathering glass, pouring, shaping and forming, leading of course to making your own stunning pieces, all of which you’ll get to keep and take home. But bear in mind that you’ll need a certain amount of fitness, as glass blowing is very much a physical activity, for all its skill requirement, and you’ll be on your feet for most of the day. 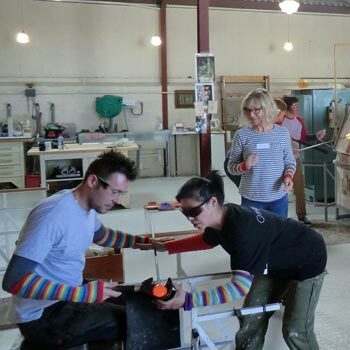 That said, we enjoyed the raw, hands-on feel of the glass blowing course, and ended the day exhausted but immensely proud of what we’d learnt and achieved during the experience. It’s an intimate experience with only two or three others normally, and the expert instructor was a star! We all know someone who’s artistic and on the look out for ways to express themselves and their artistic nature. But few of them will have learn the glass arts, even though practically all have glass blowing and stained glass on their “to-do” lists when they get round to it. So why not surprise them with a gift of stained glass creation, glass blowing or glass fusing and bring their dreams to life? Imagine their delight as they extend their artistic tendencies into this ancient but very satisfying field, and bring home their creation to put on display for all to see. That’s if you can resist buying one for yourself, of course! As of the time of writing, the number of experiences dealing with this wonderful material is severely limited. But as we said above, they do come and go very rapidly as they appear on the market and get quickly booked up. So our advice would be to bookmark this page and check back regularly.